As we enter 2019, we can see how Carnival Glass Worldwide has truly lived up to its name. Our NetworK Facebook Group has thousands of members, from all corners of the world, and it's great to welcome more new members every day. 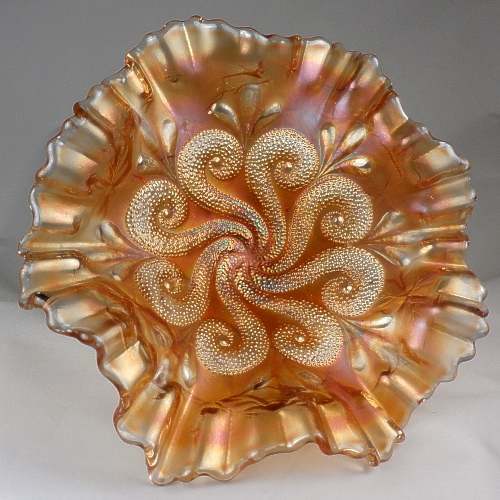 The energy and the activity levels in the Group are absolutely amazing - there are so many posts showing us beautiful Carnival Glass, from Classic to Contemporary. It's no exaggeration to say that we all learn something new each day. This ezine is also going out to a record number of subscribers, and many more read it online. THANK YOU for being such tremendous supporters of Carnival Glass! ​Almost 300 pages long, this encyclopaedic e-book is a visual delight, and it's a huge volume! 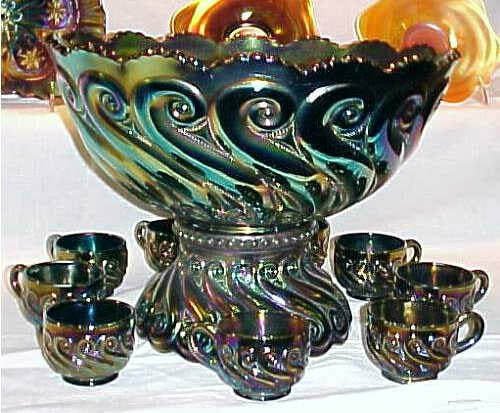 It covers an astonishing range of almost 800 Carnival Glass patterns from over 50 glassmakers in Europe. Patterns are meticulously identified with clear photos, catalogue illustrations, the reported colours and shapes, factory attributions and original makers' name where known. ​Here are some of the unsolicited comments we have received about our new e-book. … European Carnival Glass has finally been given the platform it has long deserved. 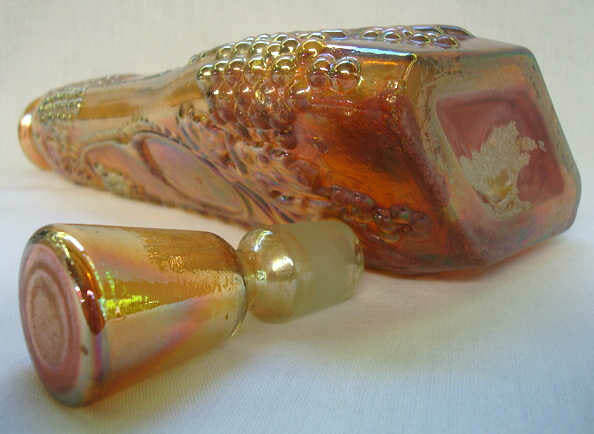 ​to buy our Carnival Glass from Europe e-book. This is a beautiful, rare vase … and now it also presents us with an intriguing mystery. Thanks to Brian Gray, here is the source of this intrigue - Brian owns the mould from which the Panelled Treetrunk vase was made, and he has kindly shared with us this picture of it. The mould for Panelled Treetrunk, courtesy of Brian Grey. ​Panelled Treetrunk has been attributed to Dugan. But ... the mould is marked with the moulded words Northwood Co, as pictured on the right, courtesy of Brian Gray. Brian told us that he had heard the mould was bought by L. G. Wright in the 1930s (as part of a larger find of Dugan moulds at that time). 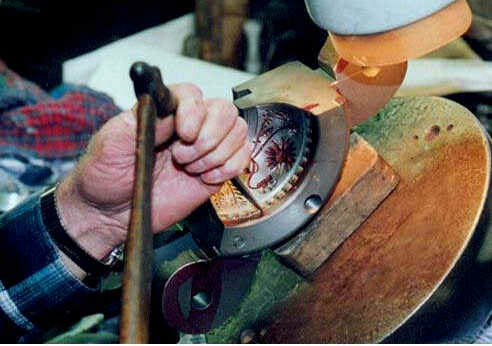 In 1999, it was subsequently purchased from Wright (again as part of a larger purchase of Wright's moulds) by Fenton, from whom it was bought by Brian. Above: Panelled Treetrunk unswung vase / jardiniere in purple. Panelled Treetrunk vases have a base diameter of 4⅞ inches. The one shown here is 6 inches high with an 8¾ inch flared top. "NORTHWOOD CO" is marked on the Panelled Treetrunk mould. So, the question is: Panelled Treetrunk - Dugan or Northwood? We know that Harry Northwood left the Northwood Works plant at Indiana, Pennsylvania in 1899 and returned to England. Glass making continued on the site, and in 1904 the plant became the Dugan Glass Co. (and was run by Thomas and Samuel Dugan). But Northwood also used that edge on some items, in particular a pattern known as Hilltop Vines (Northwood’s No. 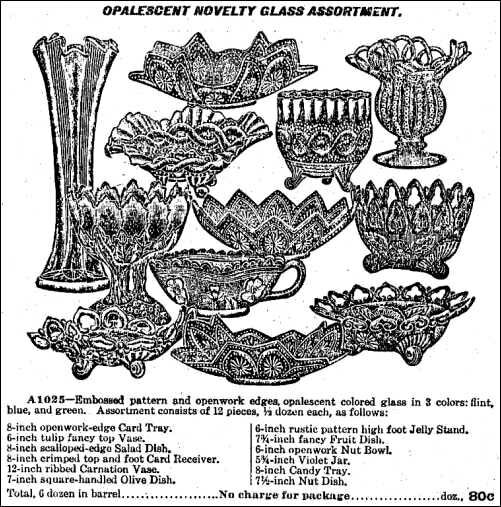 364, not Carnival), shown below (right) in this 1907 Butler Bros ad for Northwood's opalescent glass - it is the item on the left hand side, just below the vase. ​​The characteristic top edge shaping of the Panelled Treetrunk vase is also very interesting, and we associate it with other Dugan vases, such as the Target vase, as shown below. ​is a characteristic that we associate with Dugan vases. Going back to the question: Panelled Treetrunk - Dugan or Northwood? For now, the answer is unclear. If anyone can shed any more light on this enigma, we would love to hear from you. Northwood's opalescent glass (not Carnival). The story above about the Panelled Treetrunk mould adds to the fascination of the moulds and the mould makers. 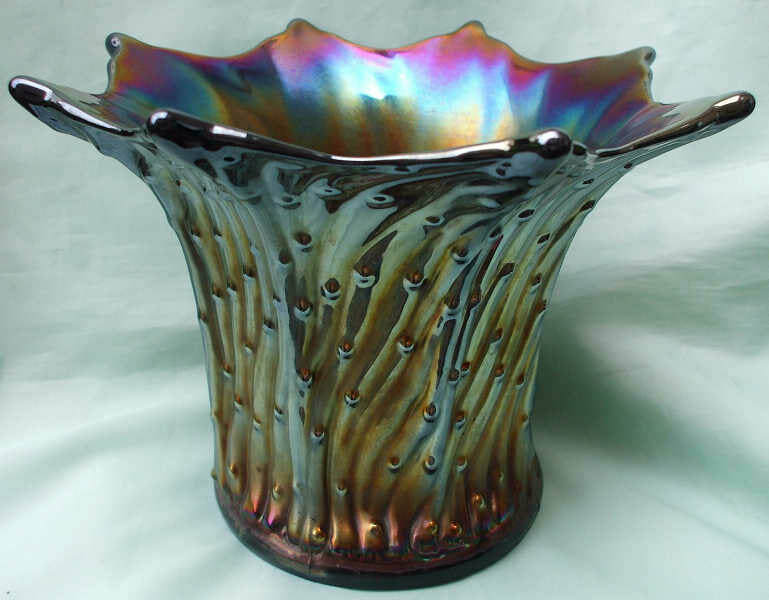 Yes, we love looking at Carnival Glass designs, shapes and forms, and we often pay homage to the many skilled glassmakers who made the glass in factories such as Fenton, Northwood, Inwald and more. But how often do we think about those who made the moulds for that glass? We were fascinated to read the above report from 1905 about a mould maker to the glass industry (Long Brothers of Kokomo, Indiana) who set up an entire exhibit to teach glass manufacturers about the role of the mould maker. The event was a sales show at a large hotel, where many glass makers were displaying their latest lines. The report explained that Mr Harry Long (Long Brothers, Kokomo, Indiana) was showing a set of “working glass moulds … where both manufacturers and dealers could see them”. ​Above - mould-making at Fenton. ​This one process of chipping, filing, rounding and smoothing the design around the top of the pattern took three days to complete for the three sections of the mould! ​As the extract from the report above explains, the mould maker could easily take weeks of skilled labour just to produce one single mould. When we handle our precious Carnival, we should give thanks not only to the glass makers, but also the mould makers whose skilled work is often overlooked. The artistry and skills involved were brought home to us in the late 1990s when Glen had been asked to design a mould and plunger for the Woodsland club (sadly now closed). We were very privileged to work with some extremely talented people at Fenton who made them and pressed the glass. ​The whole process, from initial concept to final production is fully documented on our website as a lasting tribute to the wonderful team of people who made it happen. ​Beaded Bullseye is a fairly familiar Carnival Glass vase, made by Imperial ... but have you seen the mould for it? Here it is on the left below, courtesy of Brian Gray in whose ownership it lies. In the centre is a marigold Beaded Bullseye which, after being removed from the mould, has been swung slightly and had the top shaped by being flattened and flared. It is still fairly easy to relate the vase/pattern to the mould from which it was pressed. The Beaded Bullseye vase mould. Courtesy of Brian Gray. A slightly swung marigold Beaded Bullseye vase. A swung Beaded Bullseye vase in purple. ​If you want to read more about moulds and their fundamental role in the glassmaking process, here are links to some articles elsewhere on our website. Just picture it – fifty Sowerby Covered Hens gloriously displayed on a wedding table for the guests, each containing chicken and avocado salad. We know from Robin that these Hens came from one of the extended Sowerby family who was given them when the factory was still running. ​They were from the inter-war years, 1920s into the 1930s, and were wrapped up and stored in an attic for over eighty years, before their day in the sun at the wedding. ​Photos courtesy of Robin, and thanks to Susan Corder for alerting us to the story. Thanks to Claudio Deveikis, we can show you this splendid Mystic Grape decanter. ​Claudio tells us that this amazing decanter stands 12 inches (31 cm) high, measured with the stopper. The back and front have different patterns, and note how slender the decanter is. The base is a diamond shape, as you can see in the photo. ​A fascinating piece and our thanks to Claudio for allowing us to share it here. We were so excited to see this fascinating, footed serving plate that Claudio has just found in Brazil, that we had to show it right away. ​Claudio explains that this kind of plate would have been used for little candies and salted delicatessens. This majestic beauty is 8 inches (20cm) high and almost 11 inches (27.5 cm) across. The base glass colour is a delicious soft yellow green, with a rich marigold iridescence. ​The motif on Claudio's piece is very reminiscent of the musical bass clef symbol, hence Claudio’s inspired choice of pattern name. Base Clef, courtesy of Claudio Deveikis. Does the Base Clef pattern remind you of anything? ​Claudio agrees with us that it may indeed have been inspired by Dugan’s National pattern, which is known in Carnival as S Repeat. ​The S Repeat pattern is also known as Seafoam (on the inside of the Constellation comport). ​There is also a passing resemblance to another Dugan pattern - Question Marks. Right, S Repeat and far right, Question Marks. Both are Dugan patterns. Thanks to Marty Miller whose pictures are shown here, we now know of another change to the appearance of Stag and Holly fakes. The stags on this version do not have tongues! Previous fakes have had what looked like a cigar-shaped tongue and similarly shaped jaws. On this newly reported version the stags have very strange triangular-shaped antlers, very stiff looking legs, and a stubby tail. You can see Marty Miller’s excellent photos as well as the previous versions here on our website: Stag and Holly Fakes.